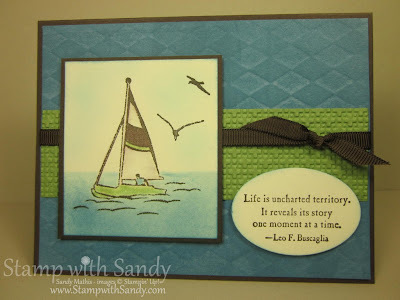 Stamp with Sandy: Control Freaks Blog Tour: Going, Going... Almost Gone! Control Freaks Blog Tour: Going, Going... Almost Gone! Since June is right around the corner, I thought I would feature some masculine projects suitable for Dads and Grads using retiring products. For ease of reading, all the products featured in bold type are those that will retire May 31. 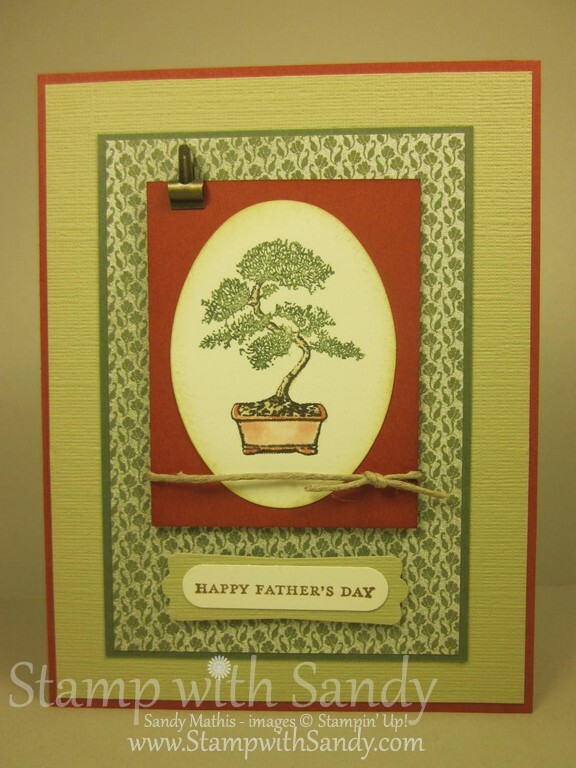 For my first project I have a Father's Day Card featuring the Plant Hope Stamp Set, one of my all time favorite stamp sets. To make it, I first cut an oval using the Ovals Die. I inked my stamp with Always Artichoke and Early Espresso Markers. 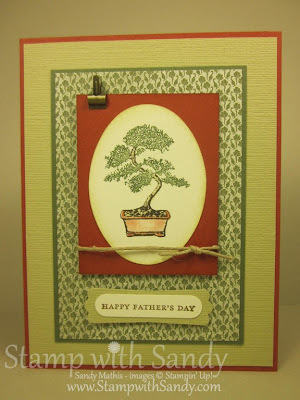 After I stamped it, I used River Rock and Cajun Craze Ink Pads and a Blender Pen to color in the stem and pot. Paisley Petals Designer Series Paper was used for the background. Mini Library Clips and Hemp Twine are the perfect masculine embellishments. 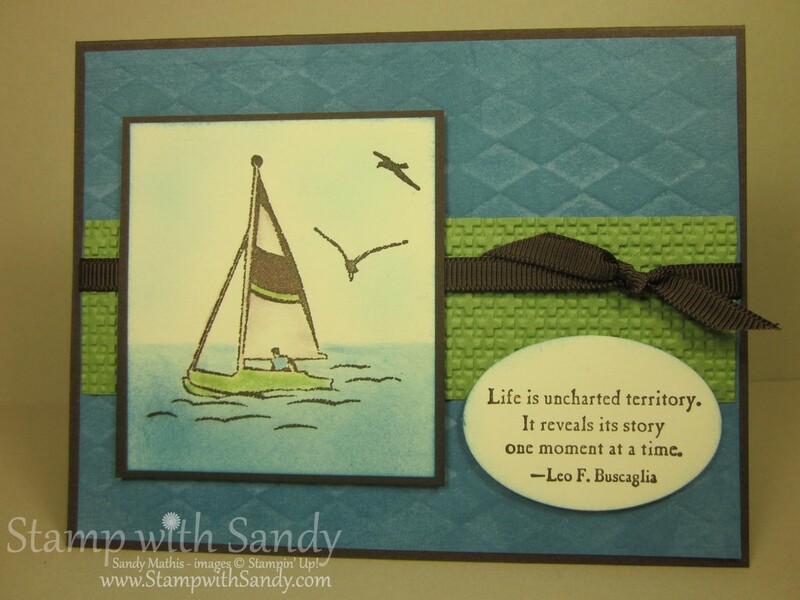 Next, I have a graduation card featuring another one of my favorite stamp sets, Uncharted Territory. Isn't the greeting just perfect for a graduate? The awesome background was made using my Big Shot and Backgrounds 1 Texturz Plates, which includes six different designs. After embossing, I used a brayer inked with Marina Mist Ink to add some additional dimension. The focal image was stamped in Early Espresso Ink. I masked off the sky and the boat, then sponged Marina Mist Ink onto the bottom area to create the water. The hull and sail were colored with a blender pen, and the clouds sponged. Some Early Espresso Grosgrain Ribbon finishes the project off. For my third project I have a two page 12x12 scrapbook spread featuring the Notes and Details Stamp Set. This is an essential set for any Scrapbooker. (Note: You can click on any photo to see a larger image). Well Worn Designer Series Paper is just perfect for masculine projects, and 5/16" Jumbo Brads are a great simple embellishment. I cut the "note" and "details" areas with Labels Collection Framelits and embossed one layer with the Square Lattice Embossing Folder. The Ticket Corner Punch, used in the top right corner of this page, is another great product retiring May 31. I think one of these pages would look great framed, and would make a great gift for Dad on Father's Day. I hope you enjoyed my projects! For a complete list of supplies, scroll to the bottom of this page. Now, it's off to go visit Gretchen Barron to see what surprises she has in store! Wow - you're coloring on those beautiful manly cards is gorgeous! And that Scrapbook page is just perfect! Sure will miss that paper. I never knew that stamp would fit so perfectly in the framelits! I agree with Wendy. These are great masculine cards, especially the Plant Hope one. I don't have the set yet but I think I'm going to get it now. Thanks for sharing! Great masculine trio! The cards are great with clean lines with lots of texture. However, my favorite piece is your scrapbook layout!! 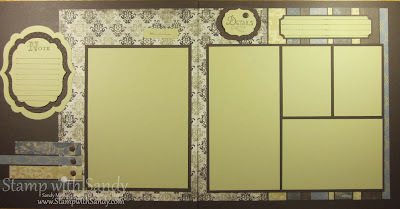 As a total cardmaker, most scrapbook layouts either make my eyes cross or don't offer enough detail to draw me in. But yours really makes sense to me-it is attractive and functional as well. TFS! Nice cards and pages. I really like the sentiment punched I word window on modern label; hope I can remember next time I use TT wishes.